Jim Kelly, the Hall of Fame quarterback for the Buffalo Bills, took the team to four consecutive Super Bowl appearances. 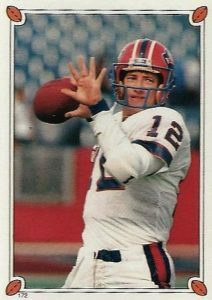 Although the Bills didn't capture the title in any of those seasons, he became one of the most popular players in the league, making Jim Kelly football cards an intriguing choice for collectors. 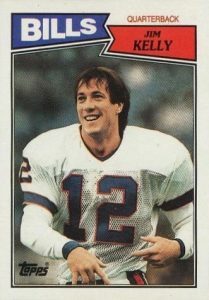 Because he debuted in the USFL, Kelly's first professional football cards came in Topps USFL sets with his NFL cards delayed until 1987. Concentrating on the earliest Jim Kelly cards, along with some later autographs, we count down ten of the very best cards available. Despite being selected by Buffalo in the 1983 NFL Draft, Jim Kelly, who played college football for the University of Miami Hurricanes, decided to pass on the Bills (and the NFL) citing his love of warm weather. Instead, he picked the USFL and the Houston Gamblers where he found quick success, earning the MVP and Rookie of the Year awards in 1984. After the USFL folded in 1986, Kelly joined the Bills to ultimately form a remarkable offense that included HOF teammates Andre Reed and Thurman Thomas. Between 1991 and 1994, the Bills reached four straight Super Bowls, which is a feat that hasn't been matched. Kelly joined the Hall of Fame in 2002 with Thomas and Reed being chosen in 2007 and 2014, respectively. Shop for Jim Kelly Autograph Cards on eBay. 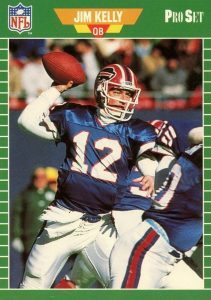 Several early Jim Kelly card appearances make the top list but there are a few additional ones to note. 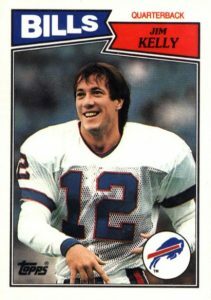 Along with the Starting Lineup action figure, the packaging included a trading card with Kelly's being one of his first as a Buffalo Bill. A non-traditional appearance came from Wheaties boxes in 1987 as he was featured in a 5 x 7-inch poster set. Fans of collegiate football cards can find Kelly in a Miami Hurricanes jersey in 2014 Upper Deck Exquisite, 2013 Upper Deck SPx Football, and 2011 Upper Deck Football. In addition, Kelly was included with Reed and Thomas on possibly the ultimate autograph card for Buffalo Bills fans in 2016 Panini Playbook. 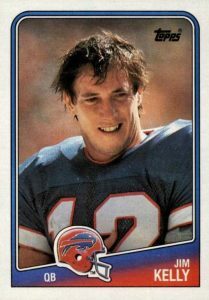 Similar to a few other football players that got their start in the 1980s, like Steve Young and Reggie White, the earliest Jim Kelly cards are found in non-NFL sets. In formulating this list, card value is the main determining factor along with an emphasis on early appearances and appealing graphic design. Kelly is featured on his 1989 Topps card throwing a pass in what looks like pre-game warmups as his chin guard is unsnapped. In an effort to spread the popularity of football in the United Kingdom, Topps took 33 star player cards from the 1989 set and made an exclusive release for the U.K. The cards are nearly identical but printed on white card stock instead of gray. The other main difference is the frame color which is mostly red for the U.S. version and primarily green for the U.K. card. Shown without his helmet and his hair disheveled, 1988 Topps features one of Kelly's most atypical cards. The youthful Kelly connected with Andre Reed for seven touchdowns in their first season together and they would go on to score 65 touchdowns, making them one of the most successful quarterback-receiver duos in NFL history. 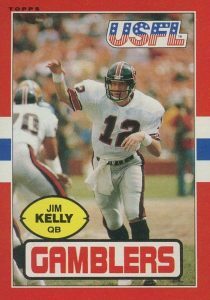 The first of three cards to honor Kelly's debut season in the NFL comes from the 1987 Topps Stickers set. Because the stickers were designed to be placed in a booklet that included player information, the fronts were very basic, sporting just a player photo framed with a football border and the sticker number. As Pro Set was preparing their first major NFL release in 1989, eight cards were produced to preview the design in 1988. Kelly was card #8 in the group and collectors can easily pick it out because it has a different photograph than his standard Pro Set card. The backs are also reversed as the test cards were structured vertically while the regular issue was horizontal. The open design of 2000 Fleer Greats of the Game allows the signature to dominate the bottom half of the card. 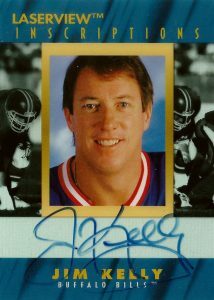 This Jim Kelly autograph card features him immediately after releasing a pass, possibly for a touchdown. Kelly's signature is very readable and clean and he frequently signs just "J" for his first name. The signing of "Kelly" involves several loops including a large one when adding the final letter "y." 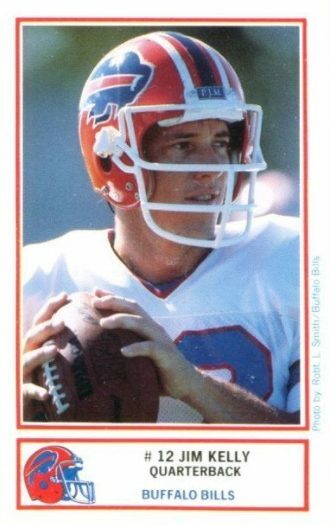 For Bills fans living in and around Buffalo, an early Jim Kelly card appearance arrived in the 1987 Bills Police set. Eight Bills players, including Kelly, Andre Reed, and Bruce Smith, were featured in the tall set (2 5/8" x 4 1/8") which was sponsored and available through the local sheriff's offices around Buffalo. The back features an extensive write-up of Kelly's USFL career as well as a message attributed to Kelly that reminds kids to not use drugs or alcohol. 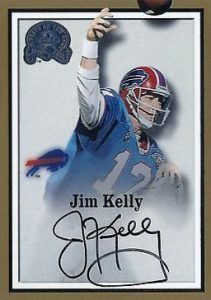 One of the first certified autographs for Jim Kelly can be found in 1996 Pinnacle Laserview. The Inscriptions insert features autographed cards on transparent acetate stock. As a result, when flipped over, you can see the autograph reversed. The back also features hand numbering and Kelly's card has 3,100 copies for fans to fight over. Other signers in the set include Brett Favre and future Michigan coach Jim Harbaugh. 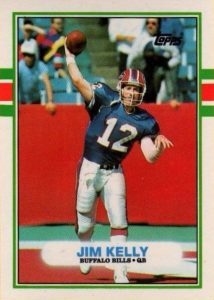 Much like card #10 on the list, the Jim Kelly rookie card from 1987 Topps was available in both a standard American release and an 88-card set in the United Kingdom. Again the designs are similar but the slightly smaller European version (2 1/8" x 3") features the team logo in the lower-right corner, making it a popular NFL rookie option for many collectors. 1985 Topps USFL was the second and final set featuring players in the NFL's biggest competition of the 1980s. While it kept the red, white and blue design, it switched the white border for a red one in 1985. Before the entire league went bust in 1986, Kelly's team, the Houston Gamblers, went out of business and he was transferred to the New Jersey Generals where he would have played for team owner and future 45th president, Donald Trump. In today's NFL-focused football card market, it is easy to forget that 1984 Topps USFL has several key rookie cards and is one of the most valuable sets of the 1980s. Sold as a complete set, the cards were printed on bright white stock. 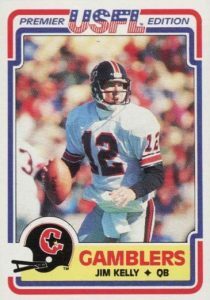 Kelly was undoubtedly the hero of the USFL's first year, winning both the MVP and Rookie of the Year for the Houston Gamblers. The team went 13-5 and also claimed the league's Central Division title. 1985 Topps USFL Jim Kelly Gamblers HoF PSA 9! !